VI.17.23 Pompeii. Steps to peristyle of Casa del Leone (blocked). Linked to VI.17.25. Excavated from 1771. “Segue un grandioso edifizio a tre piani, cui fu imposto il nome di Casa di Polibio, da un programma che vi era scritto, simile a quello riferito piu innanzi al numero 2. Aveva sulla fronte sei botteghe e due ingressi, il secondo de’quali (no.25) preceduto da vestibolo, ch’era seguito dall’atrio tuscanico privo di stanze nei lati, e con tablino nel fondo situato tra due fauci, di cui una con la scala pel piano inferiore. (translation – “Following was a large three-floored building, on which was imposed the name of the House of Polybius, from a programma that was written there, similar to that reported previously at VI.17.2. On the front, this building had six shops and two entrances, the second of which (VI.17.25) was preceded by a vestibule, which was followed by the Tuscan Atrium without rooms at its sides, and with a tablinum at the rear situated between two corridors, one with the stairs to a lower level. The other minor entrance (VI.17.23) gave access to a peristyle surrounding the garden, its walkway containing a grandiose triclinium with small room/cupboard at its side, two oeci, a windowed cubiculum, and a staircase which went up to other upper rooms, and descended also to the floor below, where the arrangement of many rooms was visible, and a large garden area with pool in the middle surrounded by porticoes”. 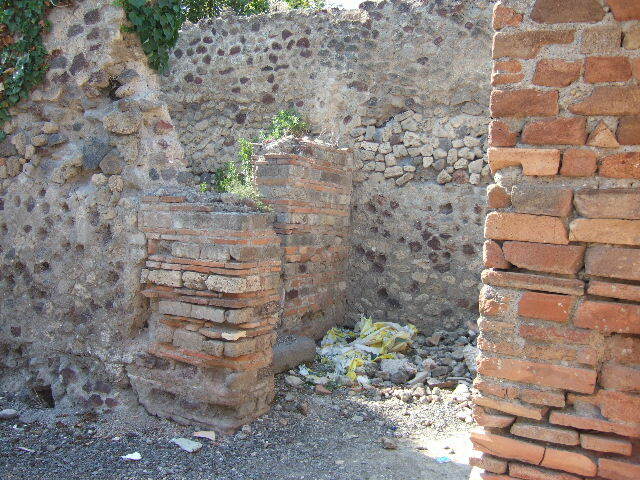 VI.17.23 Pompeii. September 2005. 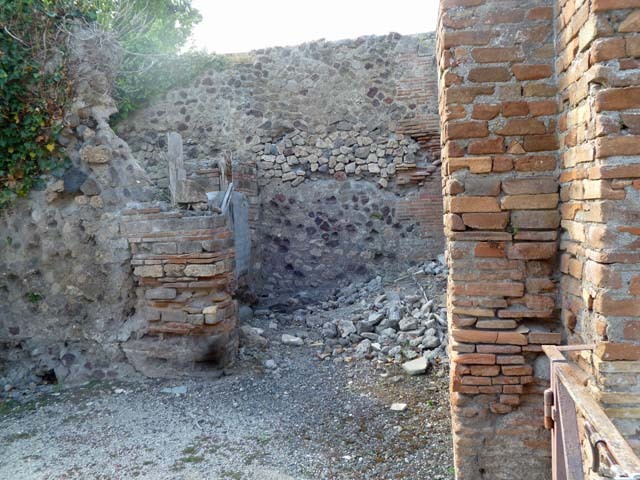 Two steps to peristyle, in room on north side of shop at VI.17.24. VI.17.23 Pompeii. May 2011. Looking towards small room on north side of shop at VI.17.24, leading to entrance to VI.17.23. VI.17.23 Pompeii. May 2005. Small room with steps to peristyle. 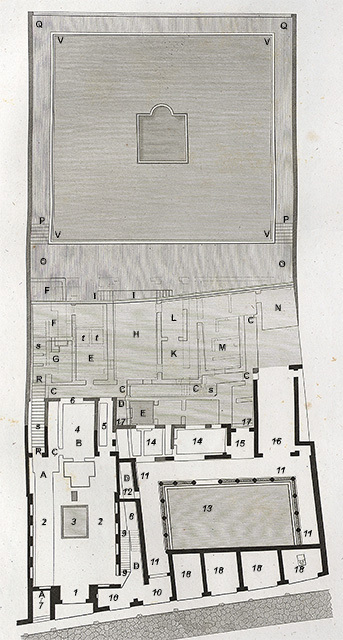 VI.17.23 Pompeii. Plan showing from left to right entrances VI.17.26, 25, 24, 23, 22, 21, 20, 19. See also VI.17.25 for description of rooms according to Mazois. According to CTP, Mazois and Overbeck-Mau wrongly showed a doorway directly onto the street at VI.17.23 on the above plan. See Van der Poel, H. B., 1981. Corpus Topographicum Pompeianum, Part V. Austin: University of Texas. (p.307, note 1). According to Jashemski, this large house with three floors adapted its plan to the terrain of the volcanic ledge it was built on. The peristyle garden to the north of the atrium was on the street level. This garden was enclosed by a portico on the south, west and north, supported by 14 columns and 2 engaged columns. A large triclinium opened off the west portico and had a view of the garden. The large peristyle garden on the lowest level was surrounded by a portico supported by 40 pillars. According to Mazois, the portico was enclosed with glass windows. In the middle of the garden there was a rectangular pool with a semi-circular projection on the west side. VI.17.23 Pompeii. Second (lower) peristyle. Marble fountain statuette of a boy with a goose. Now in Naples Archaeological Museum. Inventory number 6111. The marble fountain statuette of a boy with a goose reported as being from this house would have been a garden decoration. See Carrella, A; D’Acunto, L.A; Inserra, N and Serpe, C. (2008). Marmorea Pompeiana nel Museo Archeologico Nazionale di Napoli: SAP no.26, p.101-102, and B37. 7th November – we continue the excavation to detect other underground areas immediate to the two already made visible, which is that which is under the house that has been excavated for a long time, where a few months ago the earth was raised from above. 21st November - excavated to detect the underground area already mentioned many times, where a stairway drops down, with the hope of finding another floor below them: but it seems that such stairs had no other use than to give an exit to outside the walls of the city. Among the ruins there they found a piece of a statue, and another piece of the marble body of a bird and continued with diligence in the hope of finding the remaining parts. 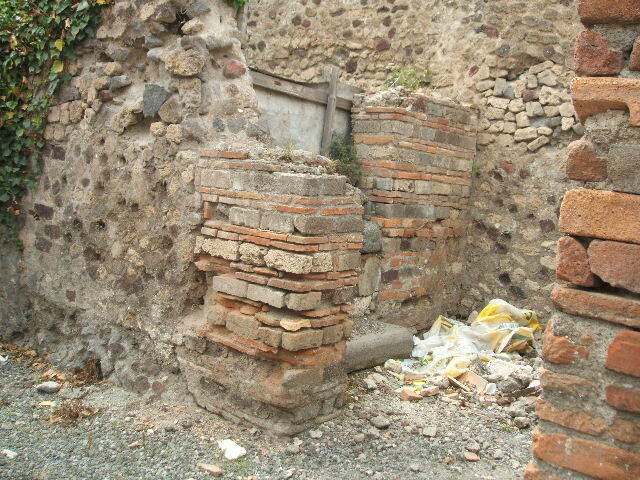 As for continuing the excavation, it was necessary to repair a wall that threatened ruin…… (PAH, vol. 1, pt 1, p.301). 28th November - excavated to reach that same floor where the portion of statue noted in past reports was found, this being found near the door which exits out of the same house outside the city. How to do such a job takes time, so for now the statue we have found has been sent to the Royal Museum. The statue was of a group, which was of a naked boy with a bird namely a goose. The boy was shown in the act of pressing with the right knee the neck of the goose, which had been drilled to pass water from the mouth: the neck of the bird was broken and his head was missing: of the young boy, there was only the body combined with thigh and right leg, and left thigh, but it was broken in two above the belly button and corresponded to a figure of about 1.32 m in height. Certainly the goose head was that which was found and taken out in another time in the same house, as noted in the report of January 28, 1764, and maybe the base of this group, with the left foot of the young boy, was found at about the same time, as described in the report of the March 24, 1764. Most of January and February was spent still searching through the same underground area, hopeful of finding more missing parts of the same statue. 27th February – after having finished doing all the searching that has been possible to find the missing parts of the known marble statue, already mentioned many times, one has passed to explore the nearby underground areas of a house already for some time discovered, where one has worked also from the first of November of the past year, as my report of the 7th of the same month. 6th March – we continue to excavate the underground areas named in the past report, without anything new occurring, working from above to take up great quantities of earth.